The short answer is you can’t, here’s why. 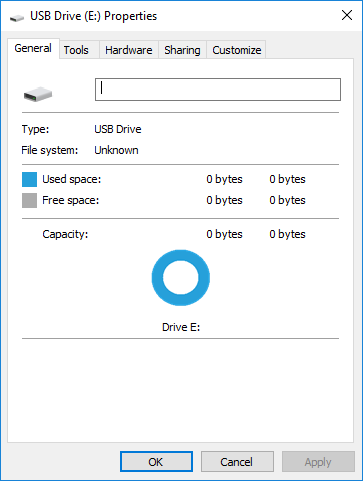 Assuming you’ve taken your flash drive to another computer and ruled out a computer issue your flash drive has a serious internal problem. Generally, it boils down to two possible problems. Flash drives have a “Flash” memory chip which stores all your data, this chip isn’t infallible, as it ages it develops errors which can cause it to partially fail. Another possible point of failure is if the flash drive was bumped and it damaged the circuit board. Either way, the only way to recover your data is to send it to a professional data recovery company like ours which can either try to repair the circuit board or remove the flash memory chip and read it directly bypassing any internal errors. Trying software tools downloaded off the internet will more than likely not work or possibly destroy all the data on the flash drive. If data recovery isn’t your goal and you just want to learn more check out a nifty application called ChipGenius, depending on your flash drive it will give you low-level information like the controller and NAND flash memory ID. This information can be used to find the MPTool (Mass Production Tool) which can be used to wipe & reinitialize the media bringing it back to life. I can’t stress this enough though, MPTool’s are used to wipe the media, not recover the data. Generally speaking, most if not all data in the flash drive can be recovered by reading the memory chip directly, however, you can’t simply buy an inexpensive NAND flash reader to recover your data. You need special data recovery software and training (seriously) to decipher the raw data from the flash memory chip. There are millions of different controller/flash memory combinations each with their own unique properties. In many ways flash data recovery is more complicated than hard drive data recovery. If you’re looking to recover your data, send it to us, our prices are reasonable compared to others we’ve been doing this for over 10 years and know our stuff.